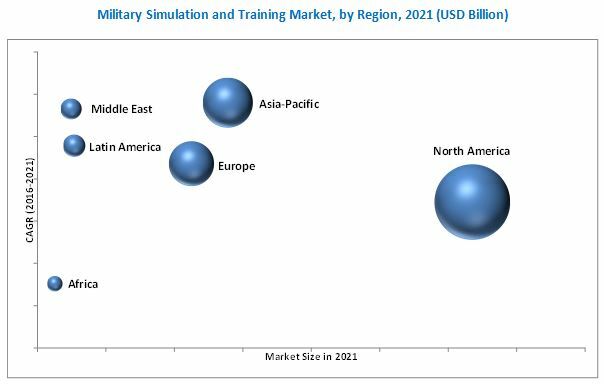 The military simulation and training market is estimated to be USD 10.31 Billion in 2016 and is projected to reach USD 12.67 Billion by 2021, at a CAGR of 4.20% during the forecast period. The base year considered for the study is 2015 and the forecast period is from 2016 to 2021. The objectives of this study are to analyze the military simulation and training market, along with statistics from 2016 to 2021 as well as to define, describe, and forecast the military simulation and training market on the basis of application- airborne (jet flight, rotary flight and UAV flight), naval (ship bridge, submarine and others), and ground (battlefield, combat, ground vehicle and others), training type -live, virtual, constructive, and gaming simulation, and map these segments and subsegments across major regions, namely, North America, Europe, Asia-Pacific, the Middle East, Latin America, and Africa. The report provides in-depth market intelligence regarding market dynamics and major factors influencing the growth of the military simulation and training market (drivers, restraints, opportunities, and industry-specific challenges), along with analyzing micromarkets with respect to individual growth trends, future prospects, and their contribution to the military simulation and training market. The report also covers competitive developments, such as long-term contracts, joint ventures, mergers, new product launches and developments, and research & development activities in the military simulation and training market, in addition to business and corporate strategies adopted by key market players. 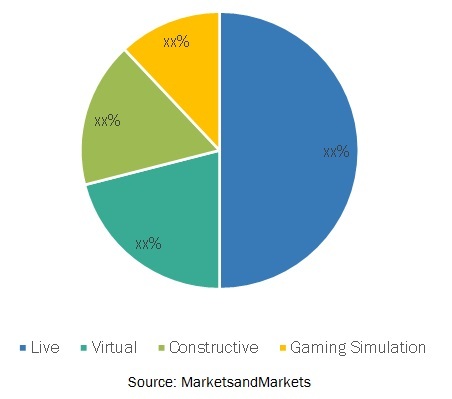 The military simulation and training market comprises training device providers, such as Lockheed Martin Corporation (U.S.), Northrop Grumman Corporation (U.S.), CAE, Inc. (U.S.), Thales Group (France), and L-3 Communications Holdings, Inc. (U.S.), among others, and component manufacturers, such as Raytheon Company (U.S.), Rockwell Collins Inc. (U.S.), Cubic Corporation (U.S.), and Rheinmetall AG (Germany), among others. They offer advanced technology systems, products, and services. They also provide a broad range of management, engineering, technical, communications, and information services, simulation capabilities, and training services. The military has been using gaming simulation for training, tactical analysis, and mission preparation. Gaming simulation is an important tool for warfare, which allows leaders to visualize the battlefield. In today’s scenario, personal computers and graphic cards have created an affordable platform for supporting games for entertainment, military training, medical education, and global communication. The gaming simulation training market is expected to grow at the highest CAGR during the forecast period. 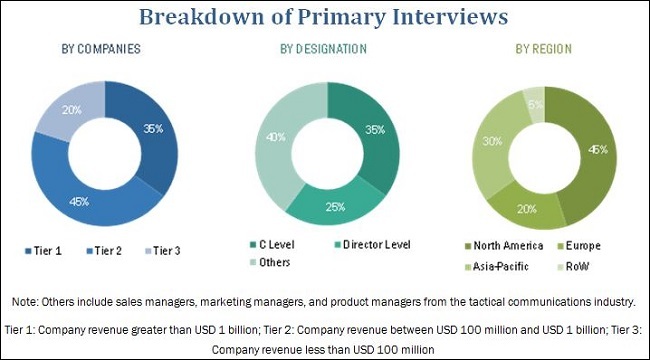 How will the Military Simulation and Virtual Training Market drivers, restraints and future opportunities affect the market dynamics and subsequent market analysis of the associated trends? What are the key sustainability strategies adopted by Military Simulation and Virtual Training Market players? How companies are adapting to change in demand of military batteries? Based on application, the military simulation and training market has been segmented into - airborne (jet flight, rotary flight and UAV flight), naval (ship bridge, submarine and others), and ground (battlefield, combat, ground vehicle and others). 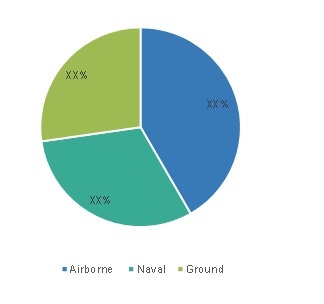 The ground application segment is projected to grow at the highest CAGR during the forecast period, primarily driven by the rising investment for military ground equipment from emerging economies. Despite budget cuts, use of simulator units for airborne application has increased. Due to integration of simulation into training, cadets are receiving advanced training for challenging situations. Rising demand for air combat simulator is one the driver for increasing investment and innovation in the military training and simulation market. This has provided several growth opportunities to manufacturers of virtual reality (VR) and augmented reality (AR) devices. To provide advanced devices, manufacturers are investing more on research and development of simulators. In addition, gaming simulation is gaining traction and could become the most preferred training method in the coming years. Airborne simulators provide training to mission crew wherein in-flight deck simulators and rear crew mission simulators are linked electronically to provide both, mission practice and crew resource management training. Simulators help military pilots to practice through airborne training exercises for situations, such as climate change, malfunctioning of internal systems of aircraft, engine failures, hydraulic and brake malfunctions, wind shears on short final, and navigation radio breakdowns. Naval simulation systems include weapon system trainers (WST), ship control simulators (SCS), machinery control trainers (MCT), submarine command team trainers (SCTT), sonar system trainers, electronic warfare trainers, radar system trainers, and tactical simulators, among others. These are comprehensive simulation-based systems that simplify realistic naval operations training. Naval simulation systems are used to command teams of ships, submarines, and aircraft to communicate effectively in a realistic training scenario. The system has three levels of control. The first being force controller that can monitor own forces. The instructor controller typically directs staff. The highest level of control lies with the manager who analyzes the entire scenario and has complete control rights. The demand for ground simulators has increased significantly in recent years. Thales Group, a key player in the military simulation and training market, has sold around 300 ground simulators globally. The demand for these simulators is more in military combined arms applications and missions. Ground simulation systems include combat training simulation systems, tactical training simulators, turret team training simulators, crew training simulators, artillery forward observation simulators, air defense trainers, driver training simulators for trucks, armored vehicle and tank driving simulators, and small arms training simulators, among others.